﻿International Day of the World's Indigenous Peoples: Calendar, History, Tweets, Facts, Quotes & Activities. The International Day of the World's Indigenous Peoples seeks to protect and promote the rights, culture and land of indigenous people. Indigenous peoples, descendants of pre-colonial times, have a strong tie to their lands and often suffer from marginalization as a minority group. Despite marginalization, Indigenous People account for about 6% of the world's population and 90% of its cultural diversity. 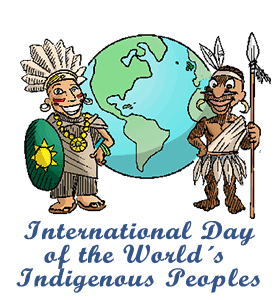 The International Day of the World's Indigenous Peoples was designated by the United Nations in December of 1994 with the intention of it lasting only a decade. It is now celebrated annually on August 9, a day that marks the first meeting of the UN Working Group on Indigenous Populations in 1982. The theme for 2017 International Day of the World's Indigenous Peoples is 10th Anniversary of the UN Declaration on the Rights of Indigenous Peoples . According to the UN, there are an estimated 370 million indigenous peoples living in more than 70 countries around the world. There are approximately 5000 different indigenous groups in the world. The Amazon River basin represents only 7% of the world’s total service area, but it is also home to 400 different indigenous groups. One of the largest concentrations of indigenous peoples in the world. Indigenous peoples represent over 4000 different languages of the 6700 know languages that exist today. Most of these languages are considered to be endangered, meaning at high risk of being replaced by dominant languages. The truth is that nobody can own anything. That was an unheard-of concept among indigenous people. We invented that. – Tom Shadyac, American comedian, director, screenwriter, producer and author. Watch a movie about indigenous people, both about their culture and uniqueness and how they are being slowly eradicated. Some suggestions are: Atanarjuat (2001), The Dead Lands (2014), Kanehsatake (2012) and Four Sheets to the Wind (2007). Donate to Survival International. All funds donated are put towards the survival and protection of indigenous peoples rights. They help to defend their lands and lives and help them determine their own future. Watch the official UN International Day of the Worlds Indigenous Peoples webcast. It is hosted in the ECOSOC Chamber at the UN headquarters and you can watch it online. Spread awareness of social media by using the hashtags #InternationalDayoftheWorldsIndigenousPeoples, #IndigenousPeoples or tag a specific indigenous group such as #cree or #inca. Organize a trip to an indigenous reserve near you or plan a trip to visit a country where much of the population is predominantly indigenous. Try visiting Guatemala, Bolivia, Brazil or the Peruvian highlands.